The repercussions of the brutal shooting-fish-in-a-barrel Gaza War, of the continued Israeli siege and boycott of the Gaza Strip, and of the vigorous colonization of the Palestinian West Bank by militant Israelis, continue to grow. The clear resistance of the far rightwing government of Binyamin Netanyahu to the two-state solution sought urgently by US president Barack Obama, in favor the massive and ongoing theft of Palestinian land and resources, has increasingly tarred Israel with the brush of Apartheid policies. The greatest danger facing Israel is no longer, as in the past, neighboring Arab armies, tank corps and missiles. It is a series of humiliations in the realm of cultural politics, most of them self-inflicted. The arts community is often pioneers in symbolically protesting human rights violations that others find it inconvenient to mention. Artists are independent-minded and often financially independent, and so cannot easily be pressured. ‘ It is after considerable contemplation that I have lately arrived at the decision that I must withdraw from the two performances scheduled in Israel on the 30th of June and the 1st of July. Chomsky was told that the Israeli government did not like his writings and that it objected to him speaking at Bir Zeit University in the West Bank but not in Israel proper. He accused Israel of acting like a totalitarian state. Ironies abound here. The Likud government has by this action legitimated academic boycotts, a political technique that the British Left in particular has advocated be used against Israel itself. Those who argued against boycotting Israel earlier were able to say that it upheld academic freedom and exchange and so should not be isolated. 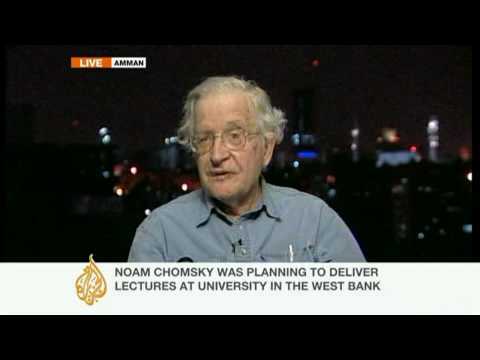 Chomsky himself pointed out that Israel was in essence boycotting Bir Zeit University in preventing his appearance there. (Another important point is that Israel was making this decision for occupied Palestinians. The latter have no voice in the matter, since they cannot vote for the Israeli government that rules them and decides whose lectures they may attend). Another irony is that Chomsky could not get official confirmation that he would be permitted to enter the West Bank on a second try, and so he addressed his Bir Zeit audience by video from Amman, with Aljazeera helping out. In the region, Aljazeera has played an important role in giving a platform to a very wide range of political views, and now this Arab media outlet is more open than the supposedly democratic Israel. The stories of Elvis Costello and Noam Chomsky illuminate two over-arching processes. Israel’s growing reputation as an Apartheid state will not result in major economic boycotts in the near term. But the step Costello took may become more and more common if the Palestinians continue to be deprived by Israel of their basic human rights. Chomsky’s story is one of self-imposed isolation on the part of Israeli officials, mired in the proto-fascist political philosophy of Vladimir Jabotinsky– the intellectual background of the Likud Party and of Netanyahu.